A new luxury townhome development is coming to the heart of Oakley. PLK Communities LLC plans to build 19 townhomes at the corner of Madison Road and Taylor Avenue, just steps from Oakley Square. The project, known as the Allora on Madison, will have homes starting at $495,000. Nick Lingenfelter, vice president of development with Sycamore Township-based PLK Communities, said the developer originally was looking at a larger-scale project for the property at 3133 Madison Road. “After working with community and other partners in the area, it made sense to build residential,” Lingenfelter told me. Allora on Madison will be built on property that was most recently a Fifth Third Bank branch location. PLK Communities purchased the two-thirds of an acre site from Fortus Group in July 2017 for $1.15 million. Fortus had planned an 82-unit apartment building, parking below grade and street-level commercial space. Demolition of the former bank branch is expected to start in the next 30 days. A rendering of the Allora on Madison from Taylor Avenue. Each townhome will have a two-car garage, three stories of living space, three private decks and the option to install an elevator. Each townhome will be 1,800 square feet, with three bedrooms, two and a half bathrooms and framed for optional elevators. Other features will include three decks for each townhome, including a private rooftop deck, a two-car garage and yards for several units. The homes will have high-end finishes throughout, including granite or quartz countertops, nice cabinetry, hardwood floors, 10-foot ceilings on the main floor and 9-foot ceilings on the bedroom floor. Allora on Madison will be LEED Silver. The project is part of PLK Communities’ Lifestyle Collection, which also includes the Broadway Brownstones in Loveland. The development will include three buildings with eight units facing Madison Road, six units facing St. Cecilia Catholic Church and five units facing Taylor Avenue. When designing Allora on Madison, Lingenfelter said he learned a number of lessons from previous projects: Buyers are interested in prime locations, contemporary designs on the interior and exterior and the ability to have a monthly payment all-in under $3,000 with only 10 percent down. Having LEED Silver certification will reduce the taxable value of the townhomes by $400,000 for 15 years, as the city of Cincinnati offers a residential tax abatement. Lingenfelter said the all-in monthly payment for a townhome at Allora on Madison will be about the same as the monthly payment on an existing $325,000 home in Oakley. 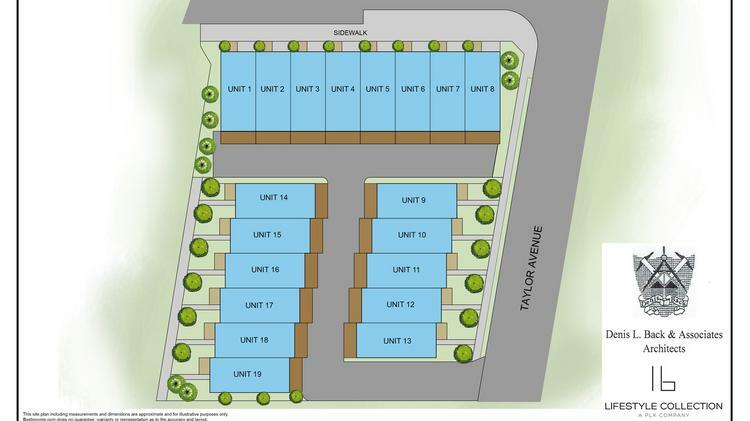 This site plan for Allora on Madison shows the three buildings and 19 units that will be part of the development. Denis Back & Associates Architects is the architect for Allora on Madison. A contractor is expected to be selected in the coming weeks. PLK Communities selected Build Cincinnati of Coldwell Banker West Shell to list Allora on Madison. Mike Hines, co-founder of Build Cincinnati, said the location in Oakley gives buyers a walkable neighborhood with suburban conveniences nearby. “There’s not a single urban neighborhood that has as much to offer as Oakley does,” Hines told me. The development’s name comes from the Italian word for “then,” or “next.” Allora on Madison is the next project for PLK Communities in Oakley, following its townhome project 2940 @ the Square. While homes will start at $495,000, pricing is still being finalized on the townhomes. Lingenfelter and Hines expect to have final pricing in the next 30 to 60 days. They also are finalizing interior designs of the townhomes, which will have three distinct options for the finishes. 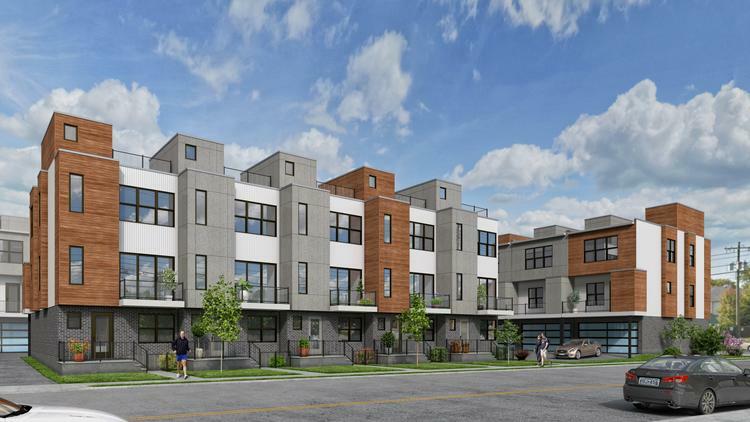 Allora on Madison is expected to deliver townhomes in early summer 2019.